I want to thank the faculty senate for the invitation to speak today. Thank you, Dan Bourland, for that gracious introduction. I am pleased that it has become an annual tradition for the President to give a state of the university address in the fall; and for the Provost and the Chief Financial Officer to make presentations in the spring. Let me begin by officially and publicly welcoming Rogan Kersh back to Wake Forest. Those of you who have had the opportunity to speak with Rogan have realized he is a dynamic leader. He brings recent and relevant experience in teaching, strategic planning and administrative management – skills sure to be assets in the role of Provost. More importantly, he loves students, and is a first-rate intellect and riveting lecturer. As an undergraduate student, Rogan experienced the transformative power of a Wake Forest education. He is dedicated to preserving the core values that made his education meaningful while finding opportunities to extend them. In short, he represents the very best of Wake Forest. I cannot talk about the very best of Wake Forest without talking about Ken Zick. After more than three decades of service to Wake Forest, Ken will step down from his administrative position as Vice President and Dean of Student Affairs at the end of this academic year. Many of you have known him as a professor, academic dean, program director and coach of moot court teams. His enthusiasm for teaching – both in and out of the classroom – is as evident today as it has been through his Wake Forest tenure. Ken, I am very grateful for your commitment to the University and our students. I will miss your keen perspective as a member of the cabinet, and I look forward to welcoming you back to the classroom after some much deserved time off. Please join me in thanking Ken for his leadership. It is a critical time in the world of higher education. 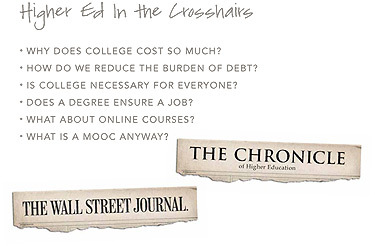 Colleges and universities are clearly in the crosshairs of public discussion and discourse. Hardly a day passes without an article or op-ed delving into a hotly contested debate. It might be the rising cost of college and the debt-burden to graduates, or how many Americans should attend college in order to sustain an educated workforce? Or the quality of higher education today and whether graduates are adequately prepared for the world of work, or whether new forms of online delivery bring into question traditional assumptions about higher education? Beyond those swirling issues, there is also discussion revolving around the future of academic medical centers and of intercollegiate athletics. Recently, the University of Virginia was quite publicly confronted with similar questions when the president, Teresa Sullivan, resigned under pressure from the Board of Regents and then later was reinstated. It seems that the Board was concerned about the pace and complexity of change and whether conventional strategies were adequate for the moment. Like the entire field of higher education, Sullivan was grappling with many of the tough issues rampant in higher education today including state and federal funding challenges, the changing role of technology in education, issues of faculty workload, research funding and activity, prioritization of scarce resources, and alumni and donor engagement. We at Wake Forest are certainly not exempt from asking some of those very questions, and if other institutions are honest, they will admit they are seeking remedies for the pressures and complexities, too. Together, we must think long and hard about our distinct mission and place in higher education, and given this identity, how we address the complicated set of issues before us. We must keep these concerns in mind as we remind ourselves where we’ve been, evaluate where we are and determine where we need to go. We at Wake Forest are fortunate to be operating from a position of strength. The economic downturn had a significant impact on all colleges and universities but we were more insulated than others thanks to the strategic decision to increase enrollment by 500 students. Growing our student body allowed us to protect faculty and staff positions, augment compensation, increase scholarship support, and launch a new set of programs. That key choice made it possible, even in the face of financial recession, to implement our strategic plan. With that context in mind, let me attempt to answer the question of where Wake Forest University stands today. When I arrived at Wake Forest in 2005, it was obvious that this was a strong institution. Wake Forest rightfully could be proud of its accomplishments and confident in its ability to accomplish even more. We found our identity as the leading collegiate university: a place where essential questions and contemporary issues are studied and debated in an environment of intellectual freedom and humane concern, within and across all disciplines; and a place where undergraduate liberal arts curricula and graduate and professional school programs are mutually enriched by collaboration and mentoring. 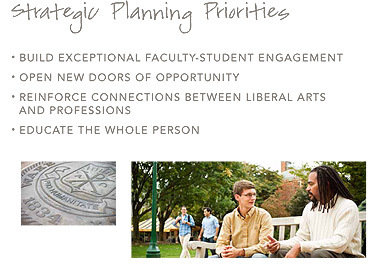 In 2008, we created a strategic plan together, engaging students, faculty, staff, alumni, and parents. Our goal was a better understanding of our distinct place in the broad mosaic of American higher education. Where did we want to go in a competitive and swiftly changing academic landscape? We knew, at least in outline, what we wanted the Wake Forest experience to comprise. We knew that we were not afraid to chart our own path, not necessarily to follow the conventions of other universities. We wanted our quality to be real, and comparable to our best peers, but our priorities and culture, distinct. educate the whole person – mind, body and spirit – while helping students find their place in the world. 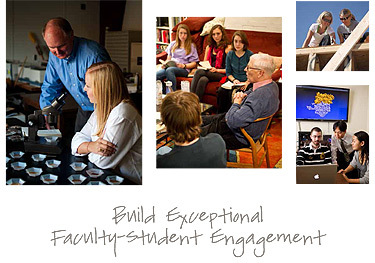 One of our key initiatives is to build exceptional faculty student engagement. Poet Robert Frost referred to himself, not as a teacher, but as an “awakener.” As educators at Wake Forest, we too must awaken our students to new truths and old traditions, showing them the mysteries of our fields and asking them to conquer questions still unsolved. Today, I am thrilled at the progress we have made on this campus in renewing faculty-student engagement. And I am deeply grateful to so many of you. In particular, I would like to thank our deans who have led these efforts with such vision, creativity, and determination: Jacque Fetrow, Blake Morant, Steve Reinemund, Gail O’Day, Lynn Sutton—and our newest colleague Ed Abraham, Dean of the School of Medicine. As part of our efforts over the past several years to build this type of engagement, we have enhanced faculty and staff compensation and devoted resources to improve professional development opportunities. The Teaching and Learning Center has been instrumental in improving our advising, mentoring and teaching support to our faculty. And our Office of Undergraduate Advising, since it opened in the fall of 2009, has welcomed more than 9000 students. This office allows a much better monitoring of academic progress, with greater chance of early intervention when problems arise. We also created interdisciplinary research centers and institutes to encourage more faculty and student engagement. 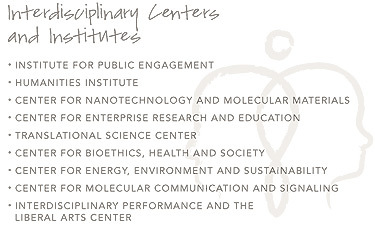 In addition to the Institute for Public Engagement and the Humanities Institute, we have seven centers: the Center for Nanotechnology and Molecular Materials; the Center for Enterprise Research and Education; the Translational Science Center; the Center for Bioethics, Health and Society; the Center for Energy, Environment and Sustainability; and the Center for Molecular Communication and Signaling; and our newest – the Interdisciplinary Performance and the Liberal Arts Center – or iPLACe. We also made a conscious effort to strengthen the role of the library in our academic pursuits. We have renewed it as a place of academic engagement. We have recognized our library team with faculty status and renovated the physical space for focused and collaborative learning experiences. This work has been heralded by our students and faculty, and also acknowledged nationally. I hope Wake Forest would be a place that continues to know the magic between great teachers and great pupils. There’s something about that kind of interaction that is at the heart of quality education. The Wall Street Journal recently featured a piece by Adam Falk, president of Williams College, who eloquently defended the case for real, live human beings teaching our young people. The highest predictor of student success is the amount of time a student spends with professors – in the classroom, in faculty offices, in the dining hall. Falk notes that education is a “social process” that has an incalculable value. You know – perhaps through your firsthand experience mentoring students – that students fall in love with learning through a personal connection with faculty. Under the direction of professors Rebecca Alexander and Shannon Mihalko, we started to formalize and stimulate the faculty-student mentored research opportunities through the creation of the Undergraduate Research and Creative Activities Center – or URECA Center. 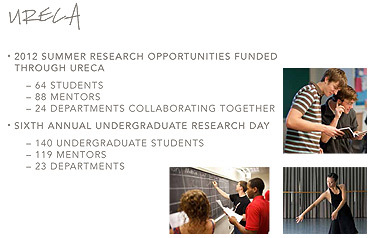 Our summer research opportunities, funded through URECA, featured 64 students and 88 mentors representing 24 departments collaborating together. During Family Weekend, we celebrated all student and faculty research at our sixth annual Undergraduate Research Day. That event highlighted 140 undergraduate students and 119 mentors representing 23 departments. We are anticipating even more robust participation in the future. We proudly refer to Wake Forest faculty as “teacher-scholars” to highlight the primacy of the classroom experience. U.S. News and World Report recently assessed our commitment to undergraduate teaching efforts as 13th in the nation. I think that ranking probably undervalues what you do. Repeatedly, I hear that because of you, students leave this campus prepared for life, graduate school, and the challenges of a complex world. True to its name, our teacher-scholar model also demands attention to research. It is our goal to foster an environment where we enable scholarship to thrive just as we have teaching. We are committed to finding resources that will protect the model we have established, and create new research opportunities for both faculty and students. Faculty members, you are the faces our students see; you are the minds our students seek for knowledge; you demonstrate the character we hope they embody; and, you have the unique ability to awaken their passion for intellectual exploration. One critical task, that we all share, is creating new opportunities for our students. And, we are pleased that the doors of opportunity are opened wide for our students to walk through. Four years ago, in another bold move, we were the first of the Top 30 national universities to become test-optional. As the issue of college admissions reaches the ears of the Supreme Court, we are proud to focus on individual students in our admission process. Our choice to rely on high school transcripts, extracurricular activities and personal interviews instead of standardized test scores has broadened our applicant pool and campus diversity. In just four years, our student body is more socio-economically and racially diverse than ever before, our number of Pell Grant recipients has doubled, and the number of first-year students graduating in the top ten percent of their high school classes has increased from 65 percent in 2008 to 79 percent in 2012. In the past ten years, the percentage of minority students has nearly doubled – culminating in 24.5 percent of our student body in 2012. In 2010, we introduced the Magnolia Scholars Program to provide first generation students financial and academic support to attend Wake Forest. 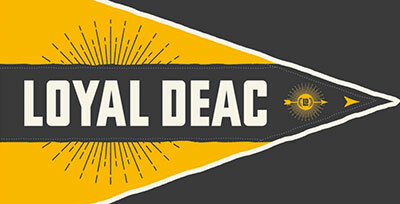 Under the direction of Nate French, this program, has nurtured more than 130 first generation students as Demon Deacons. In the same vein, we have also capped loans for low-income families, making the Wake Forest experience more accessible to students with fewer resources. We have also sought to address the financial issues of middle-income families. Our Fund for Wake Forest Scholars initiative helps to reduce loan debt for those students who have long been one of our bedrock constituencies. Our generous alumnus, Porter Byrum, has especially championed this effort as have many other Wake Forest trustees and alumni. Wake Forest has also taken significant steps to enhance the diversity on this campus. 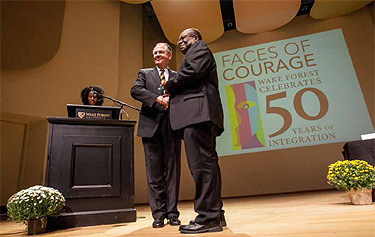 This year, in particular, we are using the theme “Faces of Courage” to celebrate Wake Forest’s decision to integrate fifty years ago. To promote more interfaith work, we welcomed Imam Griggs and Rabbi Gisser to the Chaplains Office. We established the LGBTQ Center to foster a safe, equitable and inclusive experience for all. And, in January, we expect to launch the Women’s Center. In our graduate schools, we also recognize the need for diversity. In our master of arts in business program, 36 percent of our students are underrepresented minorities. The law school has a minority enrollment of 31 percent, and our divinity school students represent 20 different denominations. Many challenges remain, but I am pleased with the overall progress that we have made in assisting all students, faculty and staff to find Wake Forest to be a welcoming academic home. In addition to opening doors of opportunity, I am pleased with the progress being made to bridge the liberal arts and the professions. Countless institutions require students and faculty to commit to either a liberal education or professional training. Wake Forest is becoming nationally known as an institution discovering creative ways to apply a liberal arts curriculum to life after college. 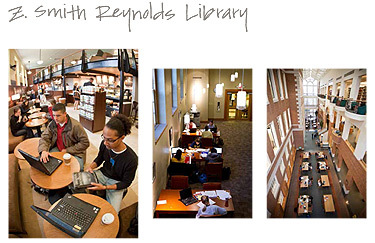 We are currently considering ways to link the resources of Reynolda Campus with the assets of the Medical School. For the last year active discussions have been underway about adding an undergraduate major or minor in biomedical engineering. It will be our first new exploration into engineering in decades, and Keith Bonin and Mark Welker are leading this effort. This program would be the first undergraduate program that would draw on the expertise of our medical school faculty. We are also considering a bachelor of arts in medicine program. Students would apply to the program directly out of high school, and if accepted, would earn admittance into Wake Forest and reserve a place in our medical school upon graduation. These students would minor in humanities and write a thesis as a graduation requirement, in keeping with our focus on the liberal arts. 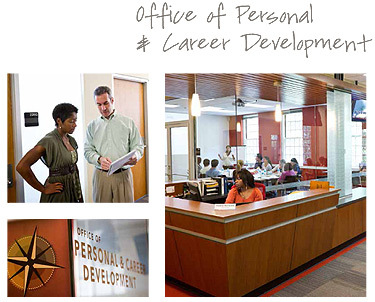 Another bridge between the liberal arts and the professions is illustrated through the work of the Office of Personal and Career Development. The OPCD has committed to assisting students – from their first orientation session to their days after commencement – in securing not just a job, but an understanding of themselves, their talents, and where they meet the world’s need. 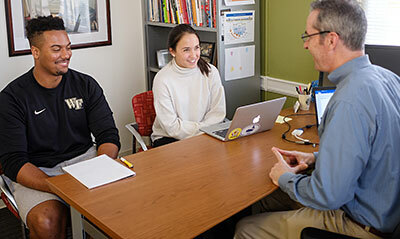 Through mentoring programs, faculty partnerships and strengthened relationships with employers, Wake Forest is creating access to information and opportunities. These efforts are as strong and creative as any program in the nation. They will greatly expand the professional opportunities as our liberal arts graduates face a most challenging job market. When Farrell Hall opens next year, we will have an enormous physical reminder of the opportunity that flourishes on this campus. 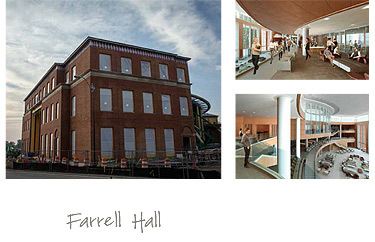 Dean of the Schools of Business Steve Reinemund has been very intentional in declaring that Farrell Hall is going to create a collaborative space for all students and faculty – not just those associated with the business school. 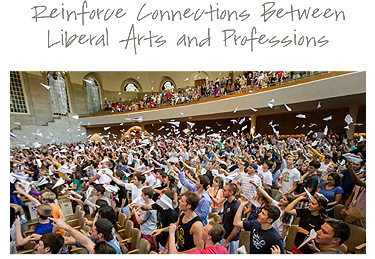 Creating these intentional intersections of different academic disciplines and ideas will reinforce the connections between the liberal arts and the world of work. Our final objective in the strategic plan was to enhance educating the whole person. We are entrusted with the task of molding complete leaders to disentangle and solve the complex problems of our world. Educating the whole person is not a new concept to Wake Foresters. From the inception of this University, the vision was one of graduates capable of applying the lessons learned here for the good of humanity. Fulfilling our Pro Humanitate motto requires education to extend beyond the classroom. I have come to think of educating the whole person as requiring a commitment to five core elements, and I believe we are well positioned to advance our efforts on all five fronts. I will close by talking about intellectual curiosity, character, wellness, global awareness and innovation. 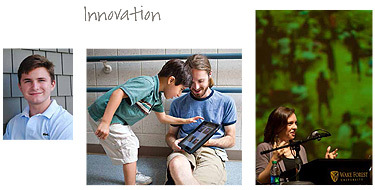 Intellectual curiosity begins with us – the educators. We must be the example to our students, and allow them to see what educational exploration looks like; we must encourage them to find their passion because they see passion in us. Every great university in the world has earned its position and reputation based on the quality of its faculty. Our pursuit of greatness ends with the graduates we produce but it begins with the faculty we attract and retain. 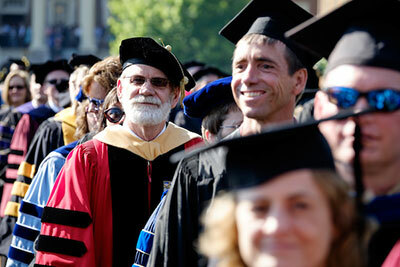 Faculty members are the foundation for the work we do at Wake Forest. This summer, I shared with the Board of Trustees my intent to create a program of Presidential Endowed Chairs. We are looking to our donors to help in creating and securing at least 10 endowed positions that will support salaries and research opportunities in perpetuity. Endowed chairs are a hallmark of a great university. They are an important tradition in education, harking back to 1502, when Margaret of Richmond, mother of Henry VII, established the Lady Margaret Professorship of Divinity at Oxford, England. The first endowed chair was established in America in 1721 when the Hollis Professorship of Divinity was established at Harvard College. Perhaps the most famous endowed chair is the Lucasian Professorship of Mathematics at Cambridge University, established in 1663 and once held by Sir Isaac Newton. All three of these chairs are still endowed today, still supporting the work of distinguished professors. Stephen Hawking currently holds the Lucasian Professorship, which has enabled his groundbreaking work in theoretical physics. An endowed chair is a magnificent gift to a university and for three reasons: It is a great gift to students as it brings another magical presence into their lives without adding a cent to tuition. The endowment, not the regular University budget, supports the faculty member and it does so in perpetuity. Second, an endowed chair is the highest academic award that the University can bestow on a faculty member. Universities with endowed chairs have a clear advantage in recruiting and retaining the most talented faculty. Thirdly, the endowment is perpetual and thus is an enduring tribute to the person who established it. 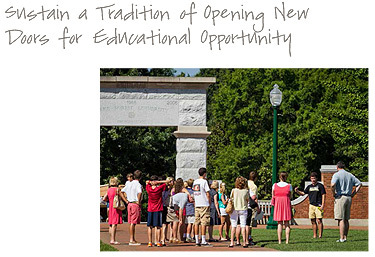 This new program will have a distinct Wake Forest feel and orientation. It will seek to recruit and reward those teacher-scholars who most exactly embody the ideals which Wake Forest has for faculty: brilliant and committed scholars who have a profound ability and commitment to teach and mentor students. These chairs should reward those brilliant scholars who love to be engaging students in the classroom. As we search for the new Vice President for Campus Life, we will continue to consciously enhance our campus as an integrated place of learning and engagement – building intellectual curiosity into all that we do and seeking to find connections in our work, our personal lives and our community. 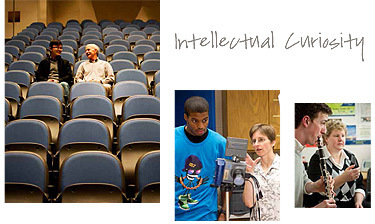 We have incorporated this into some of our newly established centers – including IPLACe, the Interdisciplinary Performance and the Liberal Arts Center, which is designed to support projects that combine the performing arts with other academic disciplines, centers and programs. To sustain and enhance the work of the fine arts at Wake Forest, we must provide the necessary space. 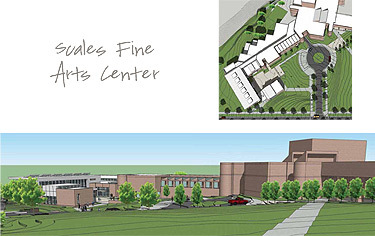 Therefore, one of the major priorities in the near future is the renovation of the Scales Fine Arts Center. Ralph Waldo Emerson argued in a famous Harvard address that character is higher than intellect. He meant that the purpose of a college education was not simply to hone the mind but also to nurture students to become more responsible people. What’s the point of learning about the true and the good if one does not apply it to life itself? Character formation can and should be one of our distinctives, our signature. We have made great strides in the work of the University’s Center for Bioethics, Health and Society, and in the Character Project headed by Christian Miller, Will Fleeson, and Michael Farr and funded by the Templeton Foundation. We have recently invested in our Chaplain’s Office to minister to students of different faiths. The Schools of Business places a strong emphasis on the importance ethics and integrity throughout its curriculum. The newly formed LGBTQ Center is resource for the entire campus community and will soon be complemented by a new Women’s Center. 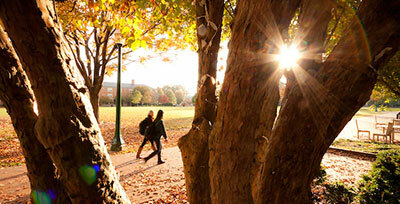 The vibrancy of this campus remains a top priority. 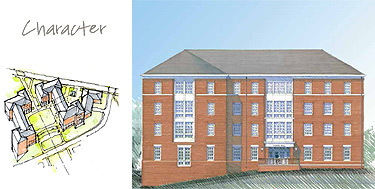 The two residence halls under construction to support the new three-year residency requirement will help keep campus the focal point of student life. Our commitment to developing students of character will be realized when we live out our values within our community – within our residence halls, in our classrooms, on our playing fields, and in our interactions with one another. Educating the whole person starts with strengthening the mind, but that cannot happen to the exclusion of strengthening the body and the spirit. A sharp mind and imaginative problem solving are only possible when the entire person is healthy. A Wake Forest education must include a commitment to creating a well-balanced life. Wellness must become a habit. Routine exercise, healthy competition, appropriate stress management and work-life balance are vital to clear thinking, problem solving and good decision-making. We must encourage students to create a vision of a healthy lifestyle, to cope with the dangers of alcohol and drug abuse, and with eating disorders. Among our new resources is a gift announced at Homecoming from alumnus Ben Sutton and his family. The Sutton family’s gift will allow us to begin plans to renovate Reynolds Gym and build additional space to combine elements of the student experience – including campus life, student health, Health and Exercise Science, student recreation and NCAA Division I athletics – in one place. 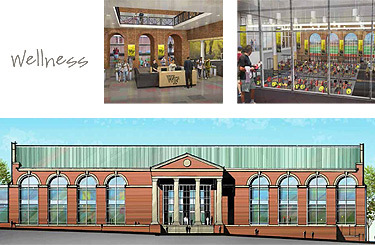 Because of the Suttons’ generosity, we will now decisively move forward with our planning process for enriching health and wellness at Wake Forest. Once we have asked students to reflect inwardly, we must compel them to focus outside their realm of familiarity. Technology has made the world smaller. Our global economy has made us increasingly interdependent. Our prosperity is linked to Greece, Iran, Russia, China, India and Brazil – each with a vastly different culture from one another and from our own. We need to ensure that our students have every opportunity to become global citizens. 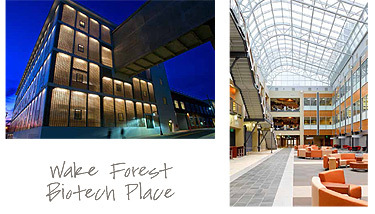 The Quality Enhancement Plan that was set forth in 2006, as part of Wake Forest’s accreditation process, set forth a number of goals that have been achieved. Under the careful guidance of Associate Provost Kline Harrison, the number of students who study abroad has increased by nearly 20 percent, with a similar increase in the number of students going to non-European locations. 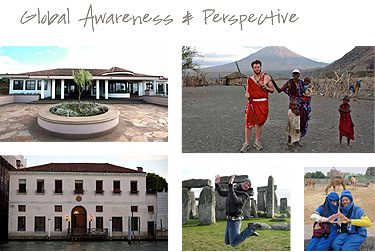 We launched the Intercultural Competency Program that focuses on pre-departure, immersion and re-entry courses for our student abroad students, and we have added more than 70 new courses with an international focus or foundation. Scholarships for study abroad opportunities increased by almost 60 percent, and our matriculating international students have increased by 30 percent. We have added a new minor in African studies, established Casa Dingledine in Nicaragua, created a new Wake Forest semester program in South America, and are exploring new venues in China. Providing opportunities for cultural exchange will ensure our students have a better understanding of global issues, and we are committed to enhancing those offerings. In the coming years, we will ensure that our undergraduate international experiences and opportunities are sustained, but also develop complementary on-campus opportunities that will translate into a global perspective for all of our undergraduate and graduate students. 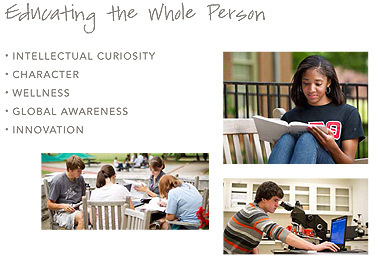 Wake Forest faculty and staff guide our students through a process of self-discovery to identify their passions. But that cannot be the end goal. We also need to help students understand how to create opportunities to apply their passion in a meaningful way. Our national and global economies are constantly in flux, and job growth is stymied. We are learning more about this generation of students from Rogan Kersh, who cites studies showing that this generation of students will likely have more than 25 different jobs during the course of their lives. We must teach our students how to be innovative and entrepreneurial in their approach to earning a living. We must equip them with the tools to be adaptive and inventive. We have seen much success in our efforts to encourage the entrepreneurial spirit on this campus. The work of the Center for Innovation, Creativity and Entrepreneurship, which was launched by a major grant from the Kaufman Foundation, continues to flourish and expand. Bill Conner has become the inaugural David and Lelia Farr Professor in this area and the center has provided various programs and grant opportunities for students. Entrepreneurship and Social Enterprise is the fastest growing minor on campus, which suggests our efforts are succeeding. We are helping students to create value from their ideas, no matter what their field. I am proud of where we stand as a University. I am proud of the students who commit themselves to their studies and the call to better themselves for the good of humanity. I am proud of this faculty that unselfishly devotes their time, energy and creativity to the past, present and future generations of Wake Foresters. I am proud of this community that sets goals and works together to achieve them, and that intentionally places duty toward others before service to self. I am also keenly aware of areas that still need significant improvement and of the stiff challenges and choices that we face is today. Among these, none is more pressing that seeking quality and continued momentum in a time of financial constraint. I recently sent you an email outlining plans for a Strategic Resource Initiative – an effort to capture funds through greater efficiency, collaboration and practical solutions to finance the University’s most important strategic priorities, including student financial aid and competitive compensation for faculty and staff. We do not have the luxury of continuing to increase the number of undergraduate students, nor of continuing to raise tuition in significant ways. 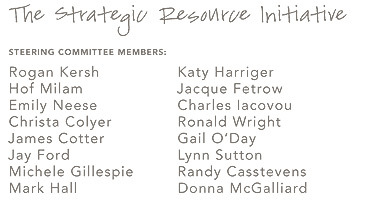 The Strategic Resource initiative, co-chaired by Hof Milam, our Senor Vice President for Finance and Administration, and Rogan Kersh, our Provost, will look to identify approximately $5 million in reduced spending and revenue enhancements. I have been asked if the effort and possible anxiety of this exercise is worth it. To be clear, we are not talking about a one-time savings of $5 million, but $5 million to reapply to strategic purposes annually. This is equivalent to receiving a $100 million endowment that will pay out in perpetuity. An effort of this magnitude takes time, possibly the better part of a year, but I believe it will be worth the effort. At the same time, the University continues to gear up for its capital campaign which will be launched publically a year from now. In the so-called “quiet phase,” we have already received over $200 million in campaign pledges; and this past academic year we received more than $50 million in cash; and the Wake Forest Funds, which represents cash gifts for the immediate use of the university and its colleges and schools, surpassed $8 million for the first time. This campaign will be absolutely essential if we are to sustain the University’s momentum. I joined with you today to celebrate what we have done, reflect on what is to come, and challenge all of us to approach our work with a renewed sense of vision and enthusiasm. I am abundantly grateful for the untold hours you have committed to Wake Forest and her students. The way in which we approach our work is the best example we can provide. A store owner and veteran once said, “Whatever you are, be a good one.” He was good at what he did. Among his numerous jobs, he was the 16th president of the United States. Whatever role Abraham Lincoln took on, he was committed to being good at it. If you are a faculty member, be a good one. If you are a staff member, or a coach, or an administrator, be a good one. If you are an alumnus, be a good one. If you are a student, be a good one. I would hope that the same could be said of Wake Forest: that we, as a collegiate university, are a little engine that knows no rest. We know who we are and have set a steady and purposeful course. But we have not arrived and we live in a time when higher education faces stiff and turbulent headwinds. We need to face these challenges together, as a community, but we need to do so with courage and innovation. To preserve and enhance those values we cherish, we must remain shrewd, flexible, and open to new ways of working together. As I have often suggested, we need novel and innovative approaches to achieve the most traditional of ends. I am deeply grateful for this University and for all of you. It is heartening to review what we claim, what we deliver, what our students pursue, what our faculty demonstrate daily, what our alumni prove, how our friends support us, and what our reputation declares. Wake Forest is indeed a very good place. Let us join hands in striving to make it even better.